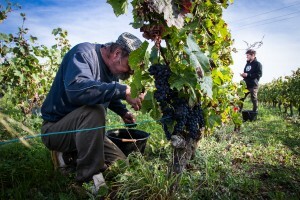 Being a farmer implies bearing ecological responsibility; this is why Jean-Marie and Thierry Puzelat converted the estate to organic vine-growing as soon as 1996. And since being a winemaker implies offering singular, digestible wines, the vinifications are performed without oenological additives since 1994. Grape harvest is performed by hand, in order to sort grapes and keep only healthy and ripe ones. The vinification process involves no input. Only very low doses of sulfites may be added upon bottling. The vinifications, performed without any provision of yeasts, are quite long. Barrel ageing allows natural maturation and settling of the wine. Only the wines aged in steel vats may be slightly filtered. 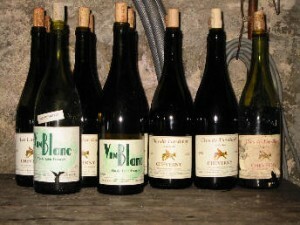 Wines aged in tronconical tanks and barrels are bottled without any filtration. For the Puzelats, making wine entails positioning as an intermediary between the soil and the glass of wine. Making the best of the parcels’ diversity. Imprinting the terroir’s and the vintage’s character. Offering vintages that express the place where they come from and the climate that witnessed their birth.